WiSE is a program that’s offered by WISH, the leading intern housing and residential life services provider in Washington DC. WiSE integrates student housing, on-line/on-site classes, intern placement and career development within a modular program that meets every school’s academic, affordable and inclusion priorities. Our WiSE program breaks down barriers, empowering school officials seeking to bolster students’ academic performance, career development and future employability in our nation’s capital. An experiential DC student internship program can now be part of a school’s reputation for academic excellence. WISH Housing announced today the launch of its Washington Intern Study Experience (WiSE), a work experience program modeled to accommodate and advance a school’s affordable and inclusive priorities through student internships in Washington, D.C., leading to higher retention rates to a degree and job. WiSE is currently accepting applications for DC internships beginning in the fall semester of 2018. As part of the WiSE program, students will reside in WISH housing, located on Capitol Hill among a community of their peers. Additionally, the WISH/WiSE Foundation Scholarship Fund provides scholarships to participating schools to make the program inclusive to all, regardless of financial status. Lewis added that “WISH partners with colleges and universities around the world providing thousands of DC interns student housing for the terms needed; fall, spring, summer or all year. Faculty housing, classrooms, conference rooms, and reception rooms are available for WISH residents’ needs. Historic venues for alumni receptions and fundraisers are available for schools. This is our foundation for launching our WiSE program,” Lewis concluded. 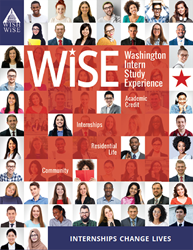 WiSE is a Washington Intern Study Experience that partners with colleges and universities that lack the infrastructure, resources or network to send their students to D.C. for a semester. The WiSE program promotes student retention toward a degree and job. WiSE integrates student housing, on-line/on-site classes, intern placement and career development within a modular program that meets every school’s academic, affordable budgetary and inclusion priorities. WiSE is a program that’s offered by WISH, an organization that has over 25,000 intern alumni. WiSE is currently accepting applications for DC internships beginning in the fall semester of 2018. Get WiSE today by visiting http://www.internshipsdc.com. For over 25 years, WISH has been the leading intern housing and residential life services provider in Washington DC. WISH works with Colleges and Universities around the world to provide thousands of DC interns student housing for the terms needed whether it be fall, spring, summer or all year. Faculty housing, classrooms, conference rooms, and reception room are all available for WISH residents’ needs. For more information go to http://www.internsdc.com.